Here we go again. Horrific photos of motionless bodies strewn like bloody rags across the pavement. Pixelated images of the dead. Huge blood-spatters on the paving stones. Shiny foil body-bags. A smashed-up vehicle abandoned on the sidewalk. Later, no doubt, there will heaps of teddy bears and candles and flowers all along the 400-yard route of carnage. And, despite the claim of responsibility by the Islamic State, I can guarantee you that this atrocity had nothing to do with Islam. Nothing whatsoever. 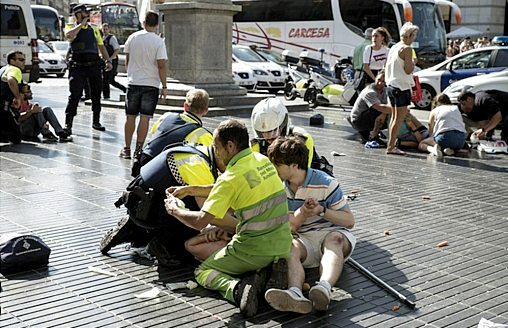 We’ve seen it so many times before — Nice, Berlin, London, Stockholm, and now Barcelona. I was out most of the afternoon, so all I can do is provide a summary and list of sources. 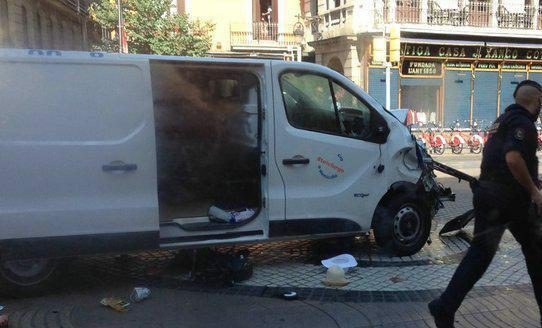 Late this afternoon at least three men in a rented van drove at high speed for a quarter of a mile down the sidewalk of a major shopping and dining street in Barcelona. At least thirteen people were killed and a hundred wounded. The driver fled on foot, and is still at large. The other two men were captured and are in custody. The van was rented by one Driss Oukabir, a Spanish citizen who is reputedly of Moroccan origin. Two other incidents — a house that exploded last night and a man who ran over two policemen — may be connected with today’s vehicular jihad.